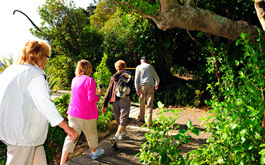 At Picton Water Taxis along with our partner company Beachcomber Fun Cruises we have a number of walk options to make your trip hassle free. Whether it be a one day walk, a couple of sections of the track, or you wish to complete the entire 71 kms Picton Water Taxis can help. This breathtaking track starts at Ship Cove and winds its way 71 km through virgin native bush over saddles, around the coast line and up and along ridge lines offering panoramic views and surreal scenery. The entire track can be completed in three days or take it as easy as you wish with the flexibility of our service you can take in this truly unique experience. Picton Water Taxis offers a 364 days of the year service and our luxury vessels are available to transfer you and your luggage each day between your accommodation stopovers, whether it be the more spacious self contained view capturing resorts and lodges, one of the many backpackers or out in the wilderness at DOC camping sites.